No light is as unforgiving as the spotlight, but to be in it while being a teenager is just plain brutal. This collection of fictional short stories highlight the struggles, hopes, failures, and triumphs of young aspiring singers, dancers, actors, actresses, and performers. While these characters may feel out of place during their everyday lives, they are able to find a home onstage and in rehearsals. Woven throughout the anthology are personal anecdotes from several of today’s most celebrated performers of stage, screen, and television. Whether hilarious or romantic or devastating or suspenseful, these diverse coming-of-age stories are perfect for anyone who is reaching for the stars. "Even a teen with only a pang of stage or screen hunger will be fascinated by this book, with its various accomplished contributors, from the introduction by Clay Aiken to stars from television shows such as Modern Family and Glee. The stories run a rich and varied emotional gamut… Each story is followed by a first-person anecdote by a noted performer, which is itself followed by a brief biography. Teens needn’t be star-struck to enjoy this collection, as under the hubbub ofthe theater world are themes that deal with common teenage issues such as insecurity, jealousy, the fear of coming out and young love. Definitely worthy of applause." "For any teen who has dreamed of being a star, Starry-Eyed will serve as both encouragement and a reality check. YA authors like Alex Finn, Aimee Friedman, and Garret Freymann-Weye weave mesmerizing stories of talented kids whose lives revolve around music, drama, and the arts. They’ll meet videographers Stringbean and Goose; Becca First, Meghan’s rival for every solo, every role, but keeper of a sad secret; and the vanished Maia Crane, spotted during a bizarre production of A Midsummer Night’s Dream. 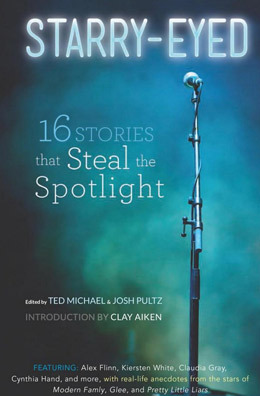 Juxtaposed with each short story is an anecdote from artists familiar and less-so… The short stories themselves, each of which is memorable for unique characters and situations, spotlight the importance of the arts in the growth and development—and even the survival!—of a large portion of the teenage population. Complex and focused on far more than art as a high-school extracurricular, Starry-Eyed “breaks a leg” in the finest sense of the word."